Children receive more annual sun exposure than adults because many of their activities are outdoor-based, including school recess, sports and playtime. This increased exposure to sunlight also increases children’s exposure to damaging ultraviolet (UV) light – an invisible, electromagnetic radiation emitted by the sun. Children’s eyes differ from adults’ in that children’s ocular lenses cannot filter UV light and prevent it from reaching their retinas as effectively as can adults’ ocular lenses. This results in children’s retinas being exposed to more UV light and susceptible to retinal damage if they are not adequately protected. Excessive exposure to UV light can lead to both short-term and long-term eye problems. In the short-term, exposure can result in bloodshot, swollen eyes and a hyper-sensitivity to light. In extreme cases, this exposure can present itself as photokeratitis – which is sunburn of the eye. Photokeratitis can be so severe that it leads to vision loss for up to 48 hours, which can be terrifying for both the parent and the child, but its symptoms will gradually fade and vision will return. Because UV exposure is cumulative, it is important to begin protection at an early age. Over a lifetime, damage from unprotected exposure to UV rays can lead to eye diseases and conditions that will affect the health of the eyes and vision. Unlike the short-term problems caused by UV rays the long-term damage caused by repeated overexposure will not fade as the symptoms and conditions caused by repeated overexposure appear over a longer period of time. Click here to download UV Damage and Children: Signs, Symptoms and Prevention Tools to learn how to best protect children’s eyes from UV rays. 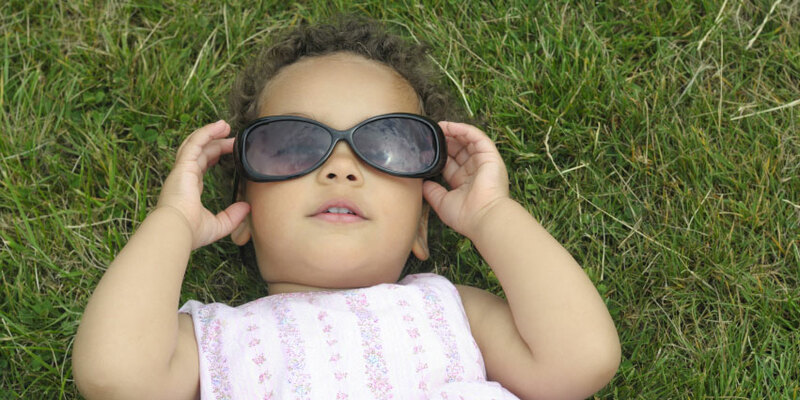 Fortunately, the solution for protecting children’s eyes from UV exposure and damage is an easy one – outfit them with sunglasses that filter out both UVA and UVB light, and make sure they wear them. Wearing hats and playing in shaded areas help reduce UV exposure, but are not a substitute for the protection achieved by wearing sunglasses because UV rays can reflect off of a variety of surfaces. Two of the most important features parents should look for when purchasing sunglasses for their children are sunglasses that are comfortable and a style that the child likes, because if either of these characteristics are missing, children will not wear the sunglasses or be protected from UV exposure. Another suggestion is to bring children along on the shopping trip so they can feel like they have a voice in the buying decision. All of these actions will help increase the likelihood that children will actually wear the sunglasses they are provided.